When is it too early to put Holiday lights/decorations up? Today I was driving through Pittsburgh and discovered a house all lit up with a very elaborate display of Christmas lights. I'm one who tends to really enjoy the holiday season (even though I'm not religious), but I was a little shocked at how early that display was put up. For, me, I'm not really ready for the Christmas season until after Thanksgiving... especially when it comes to decorating. However, I usually do start buying gifts earlier. Re: When is it too early to put Holiday lights/decorations up? Well, I said Halloween, but only for outdoor decorations, such as lights. I think it's easier to hang the lights while it is still fairly warm outside. But I won't turn the lights on until after Thanksgiving. Outdoor figurines (Santas, sleighs, etc) won't go outside until after Thanksgiving, and certainly the Christmas tree and indoor decorations will wait until after Thanksgiving. I normally don't put up my artificial tree until after December 1st. Same as in your other decorations poll; I haven't voted yet. Would you care to add another possibility? Traditionally people start decorating at or around the beginning of Advent (first Sunday of Advent). That's the last November weekend or first December weekend. Some lights around the windows are put up then and maybe some window decorations made by kids. Christmas trees will follow much later (shortly before Christmas) and such things as figurines are not common here (although a certain type of Santa doll, hanging out of a window, has been becoming quite popular over the last years ). In general, decorations are far, fare less than in the US. Oh and for us non USa folk - when exactly is labour day and thanksgiving!?! Well - there is a neighbour next to me who puts their christmas decorations up - in full and in a very american way - just after bonfire/guy fawkes night (5 November) - I'm actually surprised stuff isn't already up.... guessing this will be their task for this weekend. Oh and yes - much less decorations than in the USA but like halloween we are getting more and more into the festivities and being more american and festive like with the decorations. i still have bno outside lights though. i'm thinking of my electricity bill/carbon footprint!!! A radio station here in Belgium has launched an 'appeal' not to start putting up christmas decorations, or play that 'dreaded' christmas music on the radio or in the shops before december 15th. They even made a sticker that says 'for god's sake, no christmasfuss before december 15th'. This has caused quite a stirr, many shopkeepers feel they are being targeted and are not happy! I agree though, 2 or 3 weeks of christmas is enough for me. We usually put up our christmas decorations and a tree, the first weekend after Sinterklaas, which is on december 6th. They've been running those damned Christmas ads on TV for the past two weeks! And the stores put their Christmas trees up in SEPTEMBER! I'm sick of Christmas already! Pretty soon they will be doing this whole Christmas deal year round, don't you think? hey David. We still celebrate Sinterklaas even though my kids now 'know about Sinterklaas '. Of course for us, it's just another excuse to have a big chocolate feast! so tell me what Sinterklaas is then guys! I went to NY last week and put up the lights outside my mother's house, just this past Sunday. okay, Kelda. This is from Wikepedia - http://en.wikipedia.org/wiki/Sinterklaas Now you all know where Santa Claus came from! Sinterklaas (also called Sint Nikolaas in Dutch) and Saint Nicolas in French) is a holiday tradition in the Netherlands and Belgium, celebrated every year on Saint Nicholas' eve (December 5) or, in Belgium, on the morning of December 6. The feast celebrates the name day of Saint Nicholas, patron saint of children. It is also celebrated to a lesser extent in parts of France (North, Alsace, Lorraine), as well as in Luxembourg, Switzerland, Germany, Austria, Poland and the Czech Republic. The traditions differ from country to country, even between Belgium and the Netherlands. In the Netherlands, Saint Nicholas' Eve, (December 5) is the chief occasion for gift-giving. The evening is called pakjesavond ("presents' evening"). Traditionally, presents are ingeniously wrapped, and are therefore called surprises. Also, presents are traditionally accompanied by a poem from Saint Nicholas. Sinterklaas is the basis for the North American figure of Santa Claus; the Dutch colonial town of New Amsterdam maintained a Sinterklaas tradition, long after it was occupied by the English and renamed New York City. The name Santa Claus is derived from older Dutch Sinte Klaas. The Sinterklaas feast celebrates the name day of Saint Nicholas (280-342), patron saint of children. Saint Nicholas was bishop of Myra in present-day Turkey and became the patron saint of children based on various legends that include resurrecting children from death and saving them from prostitution. Sinterklaas has a long white beard, wears a red bishop's dress and red mitre (bishop's hat), and holds a crosier, a long gold coloured staff with a fancy curled top. Sinterklaas carries a big book with all the children's names in it, which states whether they have been good or naughty (zoet of stout) in the past year. He also rides a white horse called Amerigo over the rooftops. In Belgium, the horse's name is "Slechtweervandaag", meaning "Bad Weather Today". The story told to children in Belgium is that Sinterklaas had just gotten the horse, and couldn't think of a name. When Zwarte Piet entered Sinterklaas' winter castle, Sinterklaas immediately asked if Zwarte Piet knew a name. Not having heard the question, Zwarte Piet said "Slecht Weer Vandaag", commenting on the weather. Sinterklaas thought Zwarte Piet was actually naming the horse, and the name stuck. Sinterklaas is assisted by many mischievous helpers with black faces and colourful outfits, modelled after 16th century Spanish clothing. These helpers are called Zwarte Pieten (Black Petes) in Dutch (see below for names in other languages). During the Middle Ages, Zwarte Piet was a name for the devil. Having triumphed over evil, it was said that on Saint Nicholas' eve, the devil was shackled and made his slave. Although the character of Black Pete later came to acquire racial connotations, his origins were in the devil figure. This racialisation is reflected in the reworking of the characters' mythos. From about 1850, Pete was said to be an imported African servant of Saint Nicholas. Today however, a more politically correct explanation is given: Pete's face is said to be "black from soot" (as Pete has to climb down chimneys to deliver his gifts). Nevertheless, the tradition has been accused of being racist, and attempts have been made to introduce Gekleurde Pieten (Coloured Petes), who are coloured blue, red, etc., instead of black. This phenomenon of "Coloured Petes" was introduced nationally in 2006 in the Sinterklaasjournaal (a TV news bulletin about Sinterklaas, which runs from the end of November until December 5). The explanation given for this was that "Sinterklaas passed through a rainbow with his boat". Traditionally Saint Nicholas only had one helper, whose name varied wildly. "Piet" or "Pieter", the name in use now, can be traced back to a book from 1891. The idea that Sinterklaas has not one but many helpers was introduced by Canadian soldiers who had liberated the Netherlands during World War II and helped organise the first post-war Sinterklaas celebration. In other regions where Sinterklaas is celebrated, like southern Belgium or Northern France, Saint Nicholas has different companions. Traditionally, in the weeks between his arrival and the 5th of December, before going to bed, children put their shoes next to the chimney of the coal fired stove or fireplace, with a carrot or some hay in it "for Sinterklaas's horse", sing a Sinterklaas song, and will find some candy in their shoes the next day, supposedly thrown down the chimney by a Zwarte Piet or Sinterklaas himself. However, with the advent of central heating children put their shoes near the boiler or even just next to the front door. Typical Sinterklaas candy is the first letter of the child's name made out of chocolate, chocolate coins, a figurine of Sinterklaas made out of chocolate and wrapped in painted aluminium foil, and coloured marzipan shaped into fruit, an animal or some other object. Children are told that Black Pete enters the house through the chimney, which also explains his black face and hands, and would leave a bundle of sticks (roe) or a small bag with salt in the shoe instead of candy when the child had been bad. Children are also told that in the worst case they would be put in the gunny sack in which Black Pete carries the presents, and be taken back to Spain, where Sinterklaas is said to spend the rest of the year. This practice however has been condemned by Sinterklaas in his more recent television appearances as something of the past. Traditionally Saint Nicholas brings his gifts at night, and Belgian children still find their presents on the morning of December 6th. Later in The Netherlands adults started to give each other presents on the evening of the 5th; then older children were included and today in that country even the youngest on the evening of December 5 (Saint Nicholas' eve), known as Sinterklaasavond or Pakjesavond (present evening). There will be a loud knock on the door, and a sack full of presents is found on the doorstep. Alternatively - some improvisation is often called for - the parents 'hear a sound coming from the attic' and then the bag with presents is "found" there. Some parents manage to "convince" Sinterklaas to come to their home personally. Presents are often accompanied by a simple poem, saying something about the child or with a hint to the nature of the present. When the presents are too bulky in size or when the quantity of presents is too large, they have to be snuck into the house while the kids are distracted. I said "any time after Thanksgiving." Seems reasonable to me--though I certainly get the point that it's easier to put up outdoor lights when the weather is still a little on the warm side. Personally, I don't care for illuminated figures (Santas, snowmen, choristers, carolers, Nativity scenes). I think they look a little cheesey. I once had a professor who was a real old-fashioned Anglophile. He put up his Christmas tree on Christmas Eve and took it down on Epiphany (Jan. 6). Labor Day is the first Monday in September. Thanksgiving is the fourth Thursday in November. President Franklin Roosevelt tried to change the date of Thanksgiving to the third Thursday in November, in part to extend the holiday shopping season by one week and give a boost to the economy during the Great Depression. There was huge public protest. Some referred to the newly positioned Thanksgiving Day as "Franksgiving." Roosevelt's decision was quickly politicized, with some people in some states celebrating the holiday as the "Republican Thanksgiving" on the fourth Thursday in 1939, and others celebrating the "Democratic Thanksgiving" on the third Thursday. In the movie, "Holiday Inn" they show the calendar and a turkey keeps walking back and forth from one date to another (between the third and fourth Thursday), poking fun at this controversy. It feels that way sometimes. Personally, I think Christmas should be like the Olympics: just celebrate it every four years, in a leap year. Take all the other years off. I kind of do that, as the spirit moves. Some years I get big yearnings to be with extended family, and we fly across the country and I make sure we all have red turtlenecks or something to increase the holiday spirit. Other years, meh. This is a quiet year. MiniMeno saw a little Christmas stuffed bear in Starbuck's yesterday, and glommed on to it and cried to leave it. "Honey, I agree, it's totally adorable, but we can't buy every cute stuffed animal we see." Then all of a sudden, she brightened and said, "Can I get it as a Christmas present?" Oh! I was startled, because I forget to think that way, even in November. "That sounds like a good possibility," says me. Now I have to go buy one, and I think she might actually be satisfied with something like that again this year. I added dates to the list in the poll and added an "other" option for those of you with other traditions and deadlines you like to follow. I've made it so that you can change your vote following this little change to the original poll. Jeff, I put her lights up for 2 reasons--it was warm, and I do NOT want her climbing over the damned fence to put them up herself. Which she would undoubtedly do. For Christmas we are going to have ironwork done on her house. What iron work? Have the fence cut and a small gate put in so my 77 year old mother doesn't cliumb over the damned fence and kill herself doing things like collecting wind-blown trash or putting up the holiday lights. 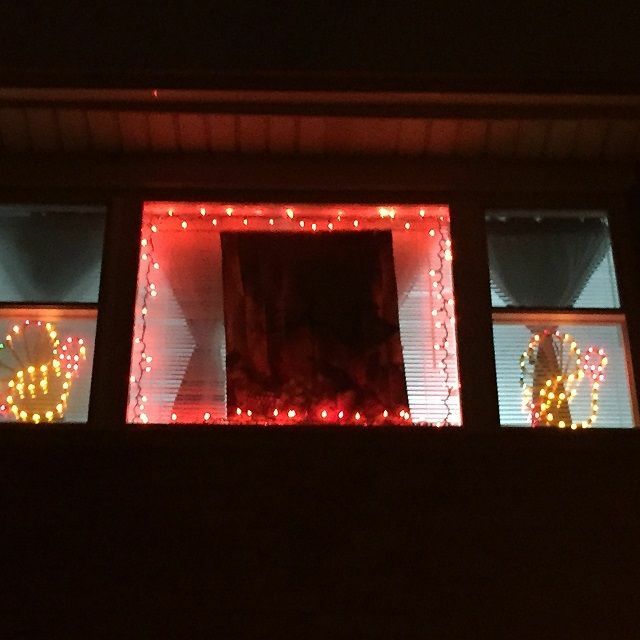 My brother can make the connections later, and light them when the window is rewady, but at least the lights themselves are in place. Here in Denver, at Thanksgiving we will hang garland outside and I'll put up lights. It's coming FAST!!!!!! Hell, I am still planting in the garden. Only about 700 bulbs to go, and 40 bags of mulch. My cousin -- who hosts Thanksgiving and Christmas because she loves to and we love for her to -- has a very big comfortable home. She begins to decorate the first week in November. She takes everything down on or by New Year's Day. She puts up 4 trees in her living room, 3 in her dining room, and at least one in every other room in the house. I have a little decorated tree that sits in the closet all year. I take it out in December and put it up before the new year. I usually leave my wreath up all of January because I get a live one, and it stays green. If I want to enjoy Christmas ambience -- I am welcomed any time at my cousin's house which also smells like cinnamon and sugar cookies at this time of year! I usually leave my wreath up all of January because I get a live one, and it stays green. I think that's nice, actually, to have that greenery up through the depths of winter. If I want to enjoy Christmas ambience -- I am welcomed any time at my cousin's house which also smells like cinnamon and sugar cookies at this time of year! She puts up 4 trees in her living room, 3 in her dining room, and at least one in every other room in the house. You mean decorated Christmas trees? More than one? Let alone 10 + ? *gasp* that's hard to imagine for non-Americans. Anyone else who has more than one decorated Christmas tree? I have a little decorated tree that sits in the closet all year. That's kinda funny. And convenient. Yes--decorated. And some have themes. One is all snowmen. One is all teddy bears. There are green ones, white ones, and one silver one that has one of those color wheels pointed at it. She's very energetic. One year the local paper did an article about her and her trees. wow wee I'd hate to think of the cost of that! It took years to accumulate the decorations. It's always best to buy after the holiday when it all goes on 50-75% off. I have a little decorated tree that sits in the closet all year. I take it out in December. I think I would do that, too, if I had the room to store a small, permanently decorated tree, for the time it would save in decorating in the busy holiday season. I don't do any of the "decorating", but I sure do the "undecorating". But hahahahJUNIOUR likes to put up the garland outside! I think me and Chrissi need to come see an US christmas - post pictures puhleese - start a new thread of decorations!!! Wow. Artificial or 'real', four trees is simply . Well, everything more than one tree I've never heard of until today... .
Now how comes this absurd thought to her mind? He he. When we go looking for a tree, we are five persons and it takes us 10 minutes at most. We go to eaxctly one selling point; the one around the corner. My hubby doesn't say anything about the choice, he's only with us to carry it home . I shortlist the ones which have the right size and the kids and I choose among the ones that are available. Done! Tell ya what: when I was a child/teenager, I lived near an American military base. It was a village on its own, partly military administration buildings, partly residential area. And they had a real American highschool. With those typical lockers in the corridors (no German school has them). Anyway, back then the securitiy level was non existing and everybody could drive through the village. Shortly before Christmas, we always drove through the American village to have a look at the exuberant decorations of those strange Americans . You want exuberant, travel a few kilometres south this year and visit Wien...Those Viennese KNOW how to do Christmas! My tree goes up on the 1st December every year ... I can't wait!! The British are fairly modest with their outdoor decorations, just a few twinkly lights in the window. I LOVE how the Americans light up the entire house (or at least the ones on telly do!). We do have the odd exception here, but they stand out like a sore thumb, and look quite ridiculous ... I LOVE EM!! Every year, we walk around the neighbourhood to admire the houses. There's one little bungalow that twinkles all over... it's beautiful, and one small semi that's completely mental ..... makes me laugh out loud every time I see it ... it really lifts my spirits. We were never big on putting up lights when I was a kid, probably because my Dad was a total klutz when it came to either yard work or home improvement. But there was a very wealthy neighborhood where people would compete to see who could have the biggest and gaudiest display. It got to be a very popular place the last few weeks before Christmas for people to just cruise around and say "can you believe that?" Sometime during December, we'd all pile in the car and go gawk. There was one house, though, that was unforgettable. They had a walled garden with palm trees and palmettos (this was in Florida), and they had a special little enclosure for a life-sized Nativity scene. Instead of the multicolored lights their neighbors used, this house had flood lighting that was blue-toned enough to look like moonlight, and for the last few weeks before Christmas they opened the garden to the public. It was so eerie, almost like you'd done some kind of time-travel. I love gaudy Christmas decorations. They're a huge, colorful Whoopie cushion on the chair of Puritanism. This is a very interesting thread and I haven't finished reading all that is here yet. I find it particularly interesting how those of you in other places like Scotland, Germany, Belgium, etc. outside of the US feel about when to put out Christmas decorations. It is also very interesting the holidays you mention that I have never heard of. As far as when I put up holiday lights and decorations, I usually try to do that right after Thanksgiving, but sometimes it stretches up until almost Christmas day. Sometimes I put out a lot of decorations and sometimes I do very little. I haven't decided about this year yet. I always leave them out until at least New Years Day or a little later; however, I do not turn them on after New Years Day. I always heard that was bad luck when I was growing up. In the same vein, I always heard it was bad luck to take them down before New Years Day. On the way home this evening I noticed a house 2 blocks down the street where they already have their Christmas Tree up. They had the blinds closed but the twinkle lights were on and that outline was unmistakable I suppose for some people it's a matter of spreading the holiday chores out over time. Especially if there are only one or two people expected to shoulder the chores otherwise it wouldn't be much for them would it At least if you begin early and take your time you could conceivably have a few days to just be and enjoy. Ahh but it's never a chore to me Dottie ... I love love love putting up the tree! We put daft Christmas music on (eg "So here it is Merry Christmas", by Slade) then open all the boxes and get hanging. When my kiddies were little, I used to have to rearrange some of the ornaments (15 on one branch, that kind of thing). I love getting the ornaments out, we have so many home made ones from years gone by as well as tons of fairies and Santas etc (my daughters red bow covered in glue and glitter from when she was 3 always makes me smile). We don't have a "designer" tree, just a whole mishmash of pretty baubles and silly toys and loads of tinsel! Well We put ours up Sunday. We usually do it the Sunday after Thanksgiving but with things being what they are this year I did it Sunday with my Daughter. The tree we did in the house I shared with my wife, we did it up big time. We had a 9.5 ft tree and it was decorated to the hilt. We also had a secondary tree in the living room. This year i went and got a pre-lit tree at Wal-mart and put out what decorations I had. The imprtant thing is we had fun and we were togther! Awww Lee ... so pretty! We've got an artificial tree this year too. Really nice big Nordman Firs cost about £35 - £40 ($70 -$80) .... that's a lot when you've got three kids to buy presents for, not to mention a whole bunch of nephews neices etc etc. So if we've got plenty of spare cash we get a real one, but for this year, our lovely pre-lit one will do very nicely. Just 11 days to go before mine goes up! We don't have a designer tree either -- our tree topper is a Shriner's fez. That's a real nice tree, Richard. I like the little Christmas Village on the table, too. I'm posting this from my parents' spread out here near Chicago. We're going to put our Christmas tree up tomorrow and my Dad lit the outdoor lights (little white lights in the bushes and around the front door) for the first time tonight. I figured I'd better report this here. I made my first visit to an IKEA store yesterday...and they were putting up their Christmas merchandise! There were some attractive metal Moravian stars with lights inside. But I couldn't get interested...it was 82 degrees outside!! My objection to Christmas decorations in October stems from my love of Halloween and Thanksgiving. I simply can not stand having those wonderful holidays swallowed up in the Christmas industrial complex!! At my house, we make a pilgrimage to find a tree in the forest near our house on the first weekend in December. That's when Christmas officially starts, and no earlier! On my way in to work this morning, I noticed the first store to have its outside Christmas decorations up. OK, I must be losing it. This morning, there were no outside Christmas decorations at this store. 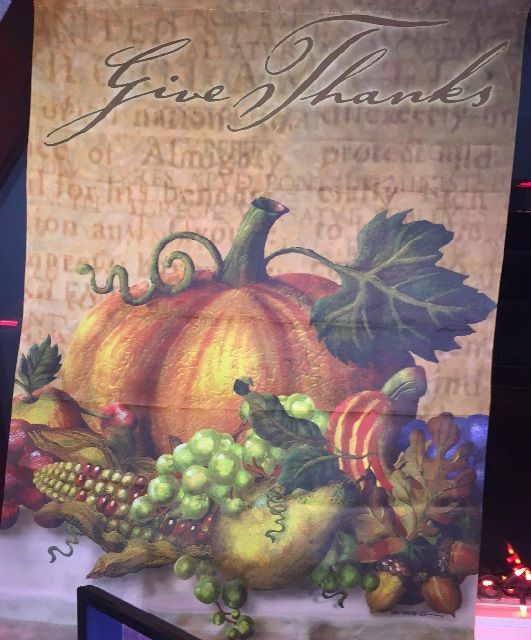 I put up my Thanksgiving stuff this week. Flag that hangs in the main picture window. Window at night without a flash. 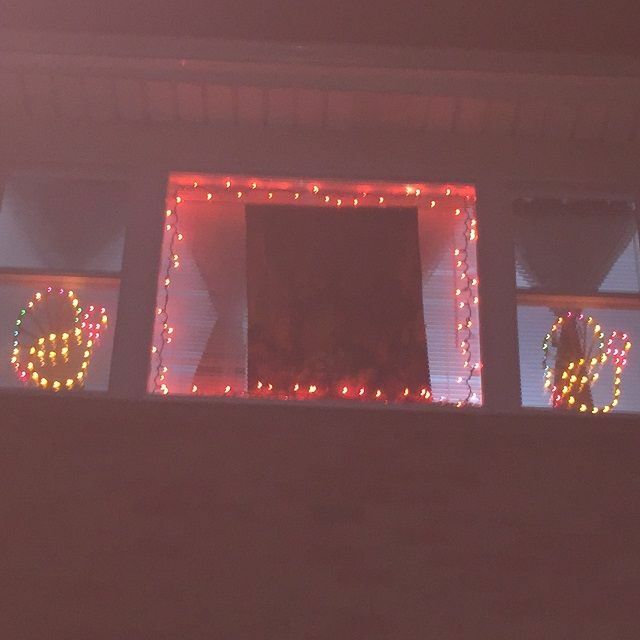 The two objects in the smaller windows are the outlines of turkeys. windows with flash....I think the 'forms' look more like turkeys in this shot. Today they are putting up the Christmas holiday tree in the lobby of the company where I work. I won't be putting my own personal ones up until after December 1st. Last night I placed the structures for my "Christmas trainyard"--a station, two houses, a church, and a general store. Next week I'll put away my few Thanksgiving decorations and think about getting out my grandmother's ceramic Christmas decorations--and also finish the train layout. Nice Thanksgiving lights, Chuck! All I have to decorate for Thanksgiving this year is a pile of miscellaneous pumpkins. But they're my pumpkins that I grew in my garden!! The Thanksgiving turkey can hear sleighbells approaching quickly in the distance!! We had a pumpkin vine once, when I was a kid. It only produced one pumpkin, and that pumpkin broke off the vine before it was matured. I did get Christmas lights, but have them stretched out on the floor, so they'll be "flat" after spending all that time in the box curled up around each other. Right, you gotta untangle them chilean sheep xmas lights, Chuck! I will probably put my few decorations up in the house on 17-18 Dec as I fly to Australia on 19th. I did not put lights in the Rhododendron tree last year, not sure this year. It does not get dark until 10pm anyway. This year I placed 250 lights in the blue spruce tree on the southwest corner of my property! They look great if I do say so myself! Sounds lovely! Are they plain white lights, or all one other color, or different colors? Yeah, we put the month first, then the day. Don't you have anything productive to do, Chuck? Like clutching your pearls or sumptin'? I do need to put my tree up.